The Merge Drawings command is enabled when the focus is on a map window that contains drawing layers. It creates a single, new drawing by combining drawing layers that appear in a map. The original drawing layers are not changed in any way. 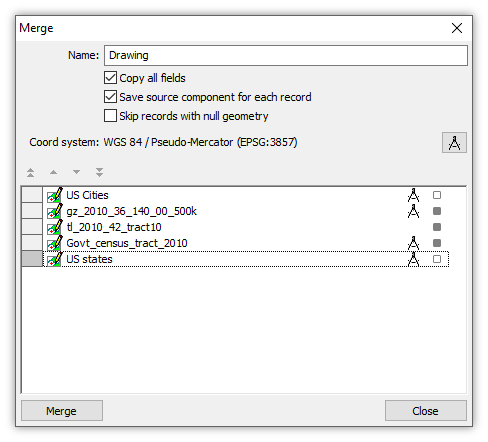 With the focus on a map window, launch the command by choosing Edit - Merge - Merge Drawings. Drag and drop the drawings to be merged into the map. Choose Edit - Merge - Merge Drawings. Provide a Name for the new drawing if the default name "Drawing" is not desired. Press Merge Components. A new drawing and table will be created in the project that combines all the merged drawings into one drawing. The above is the simple case where the map contains as layers only those drawings that are to be merged, so the default coordinate system will automatically be set to that used by the first of the merged drawings. We can also merge drawings in a more complex map that includes layers in addition to the drawings being merged. For example, a map may contain a labels layer that appears above the drawing layers that are to be merged. Double-click the on/off box to off for any drawing that is not to be merged. Choose the desired coordinate system using the coordinate system picker button, or, right-click onto one of the drawings that is to be merged, and choose Use Coordinate System to use the coordinate system of that drawing. See the Manifold 9 - Merge Drawings video for a step-by-step example using Merge Drawings. The Merge dialog shows a list of all drawing layers in the map, allowing us to choose which will be merged. Similar to how the Layers panel allows us to turn layers on and off, double-clicking on the box at right allows us to include or not include a layer. In the illustration above we do not want the first and the last drawing to participate in the merge, so we have double-clicked them off. The illustration above also shows that, of the three layers which will participate in the merge, two of the layers will be re-projected from some other coordinate system into the Pseudo-Mercator projection used by the map and which will be used by the new, merged component. One of the layers will not be re-projected, since the coordinate system matches Pseudo-Mercator. Very Important: The coordinate system used for the new drawing by default will be the coordinate system used by the map. If we would prefer a different coordinate system we can click on the coordinate system picker button for the Coord system setting and choose a different system. A shortcut way to use a coordinate system that is used by one of the drawings in the list is to right-click onto the desired drawing and choose Use Coordinate System. That will load the Coord system with that drawing's coordinate system. The Merge dialog uses the same Manifold grid controls used in the Layers panel and in many other list dialogs. Choose a name for the new drawing created by merging together drawing layers. The coordinate system to use for the new drawing. By default, the coordinate system used by the map. Change to whatever system is desired using the coordinate system picker button. To choose a coordinate system that is used by one of the drawings in the list, right-click onto the desired drawing and choose Use Coordinate System. Coordinate system picker, launching the usual menus used to specify coordinate system. Ctrl-click onto a layer row to select that layer. Move each selected layer up in the list. Move each selected layer down in the list. Move all selected layers to the top of the list, retaining their relative orders in a group at the top of the stack. Move all selected layers to the bottom of the list,, retaining their relative orders in a group at the bottom of the stack. Coordinate system icon indicating how that layer will be re-projected to match the Coord system selected for the new component. A red icon means that the coordinate system of a component is incomplete and will be treated as the default pseudo-Mercator. A black icon indicates that component data will be re-projected and that the re-projection will be curvilinear and lossy. A gray icon indicates that component data will be shifted, scaled or have axes swapped, resulting in a high accuracy transformation. No icon for vector data means that component data will not be transformed in any way. No icon for raster data means that component data might be at most shifted with the original pixel values kept intact. to all selected layers. Layers that are off will not be used in the merge.